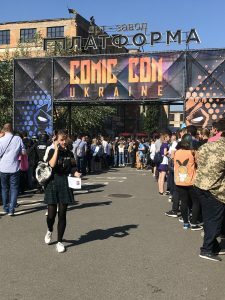 Looking back at our month in Kyiv, one of my favorite memories was taking Nolan to Comic Con. 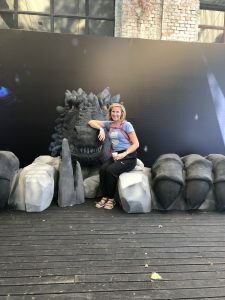 It was such a fantastic day; I thought I would share our adventure. 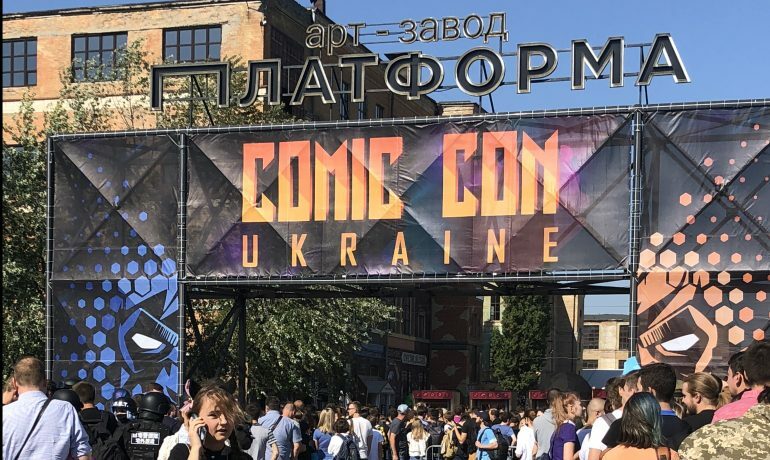 When looking for things to do in Kyiv, I came across a flyer for Comic Con Ukraine. Nolan has really gotten into superheroes in the last few months, so I knew he’d really enjoy it. I asked Jim if he wanted to go, but of course, he was a hard pass. Secretly, I was kind of hoping to take Nolan by myself, so I didn’t push it with Jim. It was a Saturday morning, and I had not previously told Nolan where we were going, only that I had a surprise for him. We started our day at Cuba Coffee; banana smoothly for Nolan and a flat white for Momma. After getting our beverages for our trip, we called our Uber. 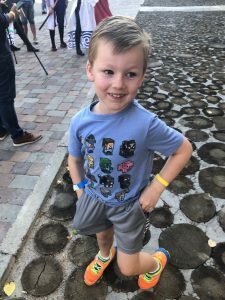 As we waited, I told Nolan we were going to Comic Con, and all his favorite superheroes were going to be there. It was a short Uber ride before we arrived at the venue. The venue was kind of like the Indiana State Fair Grounds. The event started at 12 pm, so I figured arriving around 11:45 am would be fine. EPIC FAIL on my part. It took us about 30-mins to get through the line. I was really proud of how patient Nolan was while waiting. We saw lots of people in costume, so that helped pass the time. 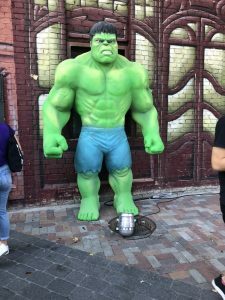 Immediately upon entering, we saw The Hulk! 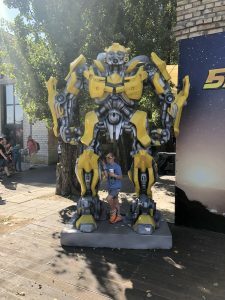 A few steps further, we saw an exhibit for the new Bumblebee movie. Nolan was very excited and ran over for pictures. 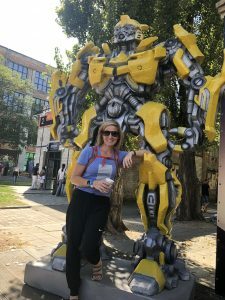 Nolan even took my picture with Bumblebee! 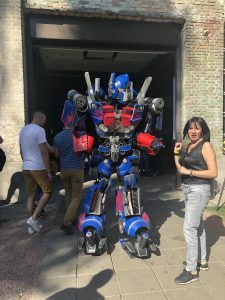 Only a few steps further, we met Optimus Prime. It was actually an impressive custom. From what I could tell, he wasn’t part of the Expo; it was just a guy in his own costume. Seriously, one awesome costume! Around the corner was a Game of Thrones exhibit. Nolan, of course, had no idea what it was, but I couldn’t resist getting a photo! 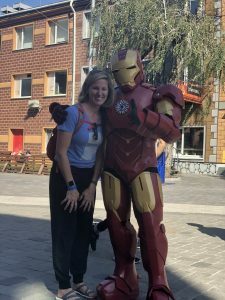 As we continued, we met Iron Man! Nolan wouldn’t take a picture with him, though he was beside himself excited. As we were standing with Iron Man, we saw The Flash at the end of the street. Nolan lost his mind! We started heading down the street, but before we could get to Flash, he went behind a gate for VIP attendees so that we couldn’t follow. I did try to yell at him to come back, but of course, shouting “Come Back” in English got us nowhere. I have never seen Nolan so googly eyed; he was so happy. He wanted to wait for Flash to come back out of the VIP area, so we sat down and waited. 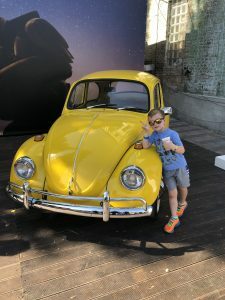 After about 20-mins, Flash hadn’t returned, Nolan very reluctantly decided it was ok for us to continue exploring the expo. I honestly think Nolan would have sat and waited all day. We explored for about an hour or so before we decided to head back to the entrance for some lunch. We got tacos and chips for lunch and sat to watch a wrestling match. 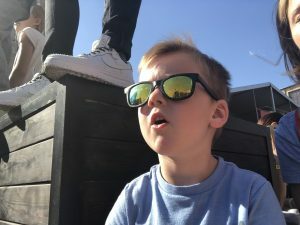 Nolan was very invested in the match! It was a belt match, and he was cheering for the champ to win. He was also very annoyed that I kept taking pictures of him. 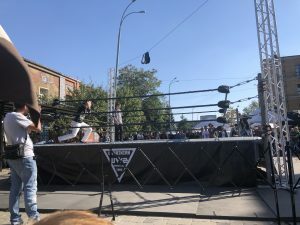 It was a really fantastic day and one of our best days in Kyiv. I fully plan on taking Nolan to Comic Con back in Indianapolis. We then talked for the entire Uber ride home about Power Rangers and why they aren’t from a Comic books ….